What’s exciting about a story we have heard hundreds of times in a multitude of forms- from hearing parts of the story woven as lullabies to put us to sleep as babies, to watching it adapted into various plays, comics, lectures, seminars, novels and name what you will. What do you expect to know from yet another version of the story? What does an author of such a book hope to deliver to their reader, without merely presenting another retelling? As it turns out, Chitra Banerjee Divakaruni has undertaken the audacious task of retelling, not one, but both of India’s epics. She does it with panache too- choosing the voice of the women protagonists in the story to bring out the nuances in the stories, overlooked in the versions we have known. Chitra’s ‘The Palace of Illusions,’- a retelling of Mahabharata in Draupadi’s voice published 10 years ago, became an instant bestseller. Draupadi, the wife of five husbands, dazzles with her strength and conviction in questioning the interpretation of justice and righteousness in word and spirit by her husbands and the circumstances they bring upon her. Chitra’s latest book, “The Forest Of Enchantments‘ is the Ramayana narrated in Sita’s voice. Sita- the forest-lover, the healer with the magic touch, the friend of plants and trees, the daughter of the Earth, decides to write the “Sitayan” after Valmiki brings her the Ramayan-the tale of Rama, as written by him. ‘When Sita questions him about the voice of Sita and other women in the tale, Valmiki entrusts her with the task of telling her side of the story- because- who else can do it better than her? And so, she embarks on the task, writing for her and other significant women in the story -Kaikeyi, Surpanakha, Mandodhari- showing us a mirror to their joy, angst, and sorrow. Sita’s voice, as did Draupadi’s – resonates with the voice of thousands of women today- their stories that reach the world devoid of a crucial element- their own voices. Chitra is also the author of several other fiction works with women protagonists who stand strong in their missions – Oleander Girl, The Mistress of Spices, Before We Visit The Goddess, Arranged Marriage and more. Devishobha: Hello Chitra! It is such a pleasure to meet you! I just finished reading your latest book, “The Forest of Enchantments” and I thought it was a powerful retelling, even though I have heard the story hundreds of times. I loved your interpretation of Sita’s decision to leave everything that was beloved to her: Ram, the love of her life; her dear sons, who have now become the anchor of her life; the opportunity to have a ‘complete family’ that has forever eluded her – only to stand up for what she believes in, and her mission to send out a message to ‘her unborn daughters’ through her iconic decision she is about to take. As a fiction writer, how do you bring your own interpretations to these situations? 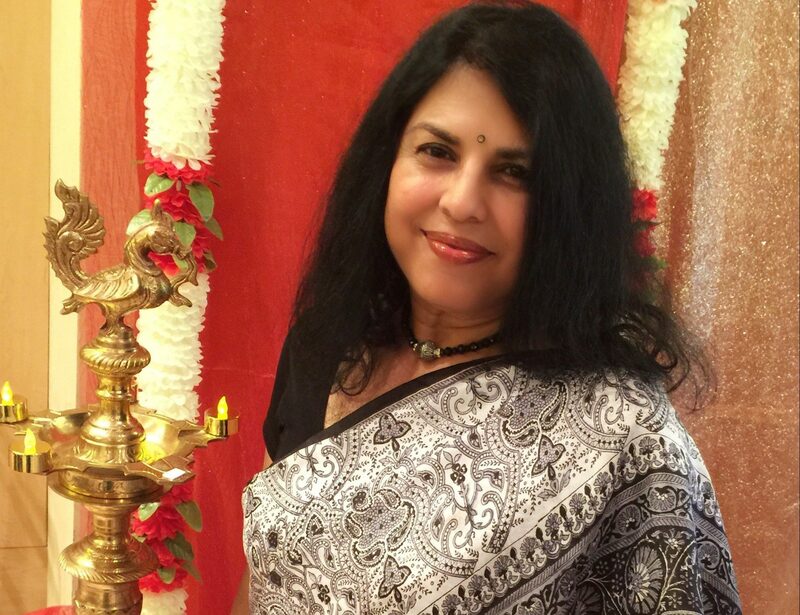 Chitra Banerjee Divakaruni: Thank you! I start novels such as The Forest of Enchantments and The Palace of Illusions with serious research, because I want to remain close to the events of the original epics such as the Ramayan and the Mahabharat. My interest is in interpreting character and motivation without changing the events, so as I write, I focus on reinterpreting character. The events of my Sita’s life are largely taken from Valmiki, but I hope she comes across as unique, complex and inspiring in her quiet strength. Devi: How did you perceive Sita in the days that you were growing-from the versions you heard? Chitra: Sita, from popular interpretation when I was growing up, was thought of as a docile wife and daughter-in-law who never protested, no matter what happened to her. Many girls, myself included, were told we should be like her. I always felt rebellious and angry when people told me this. But when I started thinking about who Sita is, I felt there was a lot more to her than that. And as I researched more, I realized how strong she really was. Devi: I also loved your other retelling- The Palace of Illusions. Some parts where Draupadi tells us that she wishes she received the boon of forgetting, instead of the boon of being a virgin all over again for each of her husbands. I think they subtly, but powerfully call out centuries of patriarchal notions embedded in society. Tell us a little about your process of characterization, especially ones that are already known to people for centuries- like Draupadi and Sita? Chitra: I always examine the main incidents where the women appear in the epic carefully. The way in which epics are presented, we find out very little about what the women are thinking or feeling. They are mostly part of the landscape, passive characters to whom things happen. So for me, a major part of writing is to imagine them as the center of the scene–Draupadi in the scene where the Kauravas are trying to insult her by removing her clothes. Or Sita when Ravan is abducting her. I focus a great deal on how the women respond and show their autonomy within the limits of what the situation allows. Thus we see that both women have a great deal of spirit and courage and do not give in without a fight. And psychologically and spiritually, they are the winners. Devi: In that sense, do you find it more challenging to reimagine characters like Sita or Draupadi than developing your own new characters? Chitra: These two things are challenging and satisfying in different ways. I have a lot of freedom with my own characters. I can make them exactly what I want them to be. With the mythic characters, the challenge is to re-create them in a way that is empowering to women today. There’s a great resonance to these important figures, and it’s very inspiring to work with them. Devi: How do you see these characters from mythology relating to the present day woman? Do you think they are still relevant? Chitra: Oh yes, I strongly believe they are relevant. Just one example: Sita is one of the earliest single parents. She brings up her sons by herself in a wonderful way. A way that we admire. This aspect of her is very empowering to many women who are bringing up their children on their own. Devi: How do you see men reacting to your books? Chitra: From the ones who have read the books, I hear many positive things. They often write to me and say that my books have helped them see a social situation or a character from our myths and epics in a totally different way. That makes me happy. Devi: What would you describe as the turning point in your life as a writer? Chitra: When I received the American Book Award for my first story collection, Arranged Marriage, it gave me a lot of confidence. I said to myself, this is what I’m going to do for the rest of my life because I believe I have something worthwhile to communicate. Devi: Moving on to writing discipline – there’s a lot of advice for young writers to fulfill a certain word count every day. You teach writing yourself, what is your primary advice for beginner writers? Chitra: I don’t believe in word count. If you push yourself to produce when you aren’t inspired, you will not be able to create anything worthwhile. But I believe in regularity. Sitting down at the writing desk as many times a week as you can, and thinking deeply about your project. Out of that thinking and imagining, the words will come. I also advise my students to read a lot. Devi: From beginning a book project to ending it, what do you most enjoy? Chitra: I am most excited when I come up with a new idea for a story or a book. Devi: You also write for young adults and children. How is the process different- from start to finish? Chitra: Young adult/children’s books are much more plot oriented. I have to make sure I have a strong and interesting storyline and colorful description. Devi: What/Who do you think has influenced your writing style the most? Chitra: So many writers! Especially women writers from different cultural backgrounds. Anita Desai, Maxine Hong Kingston, Sandra Cisneros, Toni Morrison, Cristina Garcia. But also Tagore and Tolstoy. Devi: How do you divide your time between research and actual writing? Chitra: First I create an outline of sorts, very rough, just so I know who the main characters will be. Then I need to do enough research so I have sufficient material. Then I start writing scenes. Devi: What’s brewing from your pen next for your millions of fans? I’m very excited to be writing about a strong woman who lived a hundred and fifty years ago in India and fought against the British most courageously. Her story seems to be largely forgotten, so I hope to bring her to the attention of readers. 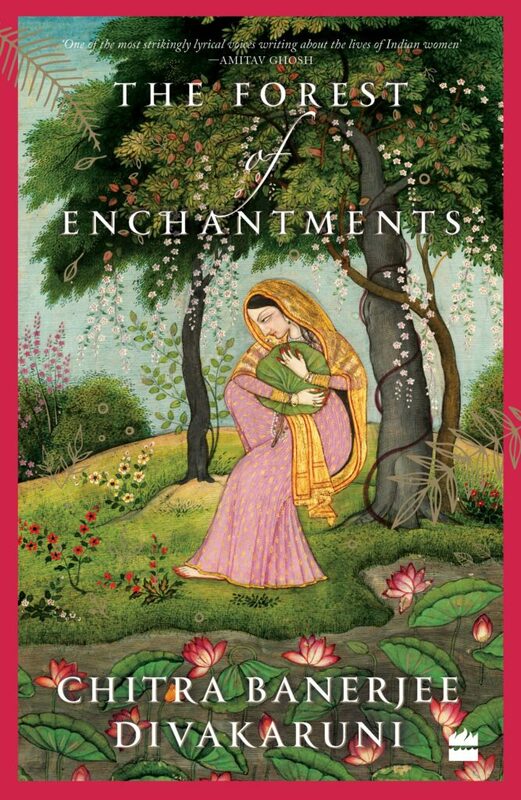 The Forest of Enchantments is published by HarperCollins and is available for purchase here.